Jack loves these These are basically moldable bits of chicken putty, and my liver-spotted dalmatian Jack loves them. Every morning he takes a big fish oil capsule that he thinks is weird on its own and two pills. I tear one of these pill pockets in half, then mush one half of the half around the fish oil and mush the other pills into the other half of the half, and he gobbles it all up without complaint. I’m stingy with these, because they get a little expensive when you have to use them every day, but they really are just the thing for getting a dog to take medicine. I’d use as many of them as necesary to get Jack to take his meds, but so far the economy approach is working. Great product! Can split in half to be more economical I’ve been using Pill Pockets for the last year or so. 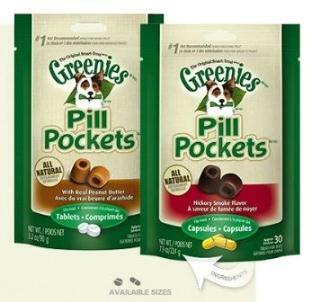 My dog has never spat one back out, and I find them much easier to use than e.g., peanut butter or bread.In the past, I’ve used the tablet size pill pockets, but decided to try the capsule version. For roughly the same price, the capsule version is far more economical. The pill pockets are huge! You can easily split them in half to make the bag last longer. I will never go back to the tablet version again. Dogs love them I have to give my lab mix 6 capsules a day. This being the dog that can somehow spit out the teeniest-tiniest pill no matter how much good stuff is wrapped around the medication, I was thrilled to find this product. The capsules I have to give her are actually too big for this pocket (hence 4 stars instead of 5) but I can moosh the pill pocket around the capsule well enough that she’s eaten the pill pocket and looking for more before she realizes that there’s medication hidden inside. 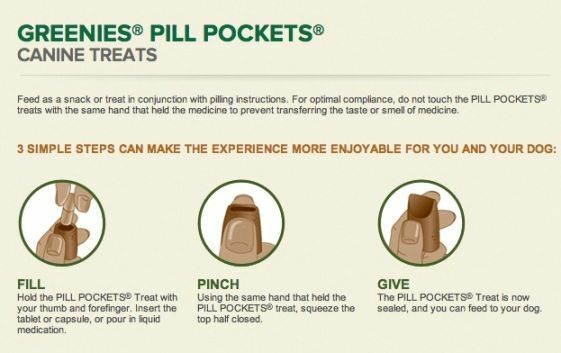 With only 30 pill pockets in each 7.9oz pouch, I’ll definitely have to buy in bulk. I’m saving so much time and energy and wasted medication; I’d definitely recommend these to anyone who has a dog who hates takes their meds.